Chris and Sonja - The Sweet Seattle Life: Photo O' the Day: Oh Seattle! Photo O' the Day: Oh Seattle! My Papa pointed me in the direction of a couple photos taken a few days ago of Mt. Ranier. 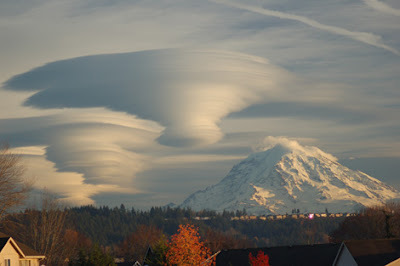 "Those are called "lenticular clouds" They're caused when the air flow is just right so when it flows over Mt. 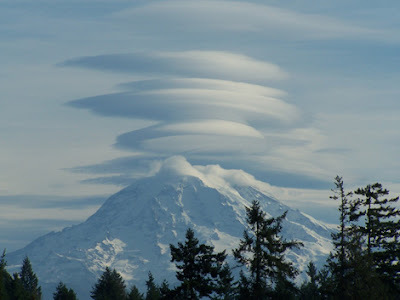 Rainier, the air gets pushed upward where it cools and condenses into clouds. Depending on how smooth the flow is, you can get some amazing clouds formations as we've seen so far today. " More photos from Komo News Here. I saw these the other day. It was pretty cool. haha...well it is a good thing you are coming back!